The fan propels a puff of air that diffuses the essential oils as it lights up with a variety of colours. Thanks to this interchangeable colour variation, you can choose your own lighting colour to create an atmosphere to your liking! Simple and effective with its 3 power levels (silent, normal, air turbo), the Ventilia essential oil diffuser diffuses your essential oils while preserving their beneficial properties, filtering the air input before venting out the fragrance. The Ventilia automatically shuts down after 30 minutes so as not to saturate the air. 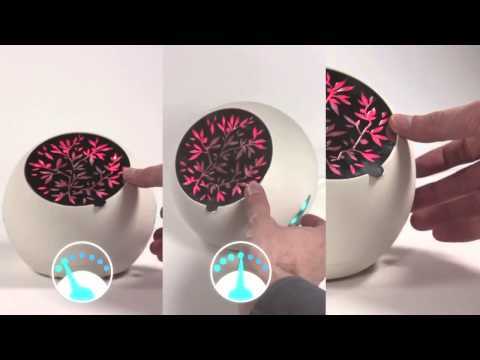 The Ventilia ventilation diffuser is a real decorative object. It will delight both beginners who want to use essential oils as a natural deodorant, and more experienced aromatherapy exponents. Diffusion by ventilation or diffusion by forced air is a cold diffusion technique. This technique retains all the benefits of your essential oils. Ventilation emits a breath of air that propels the essential oil microparticles into the air. The fan built into the diffuser projects air through the pad soaked with essential oils. With this technique, the essential oil is instantly spread throughout the room. Do not disassemble the device or clean it with liquid. Should the essential oils overflow, immediately wipe off the excess so as not to damage the product.